Keflavík. 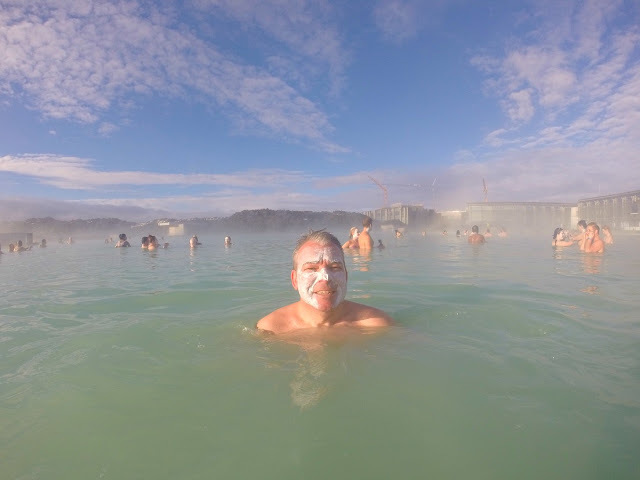 The poster boy for Iceland being featured heavily in many tourist guides, it's one of those places you wonder if you should visit on your Iceland trip. 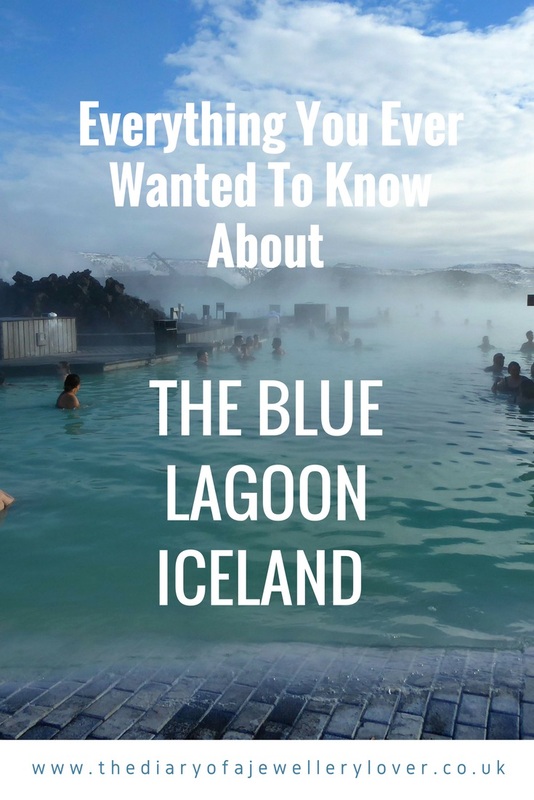 In this guide, I will look at the facts about the Blue Lagoon, the costs, the amenities, and whether it is worth visiting. 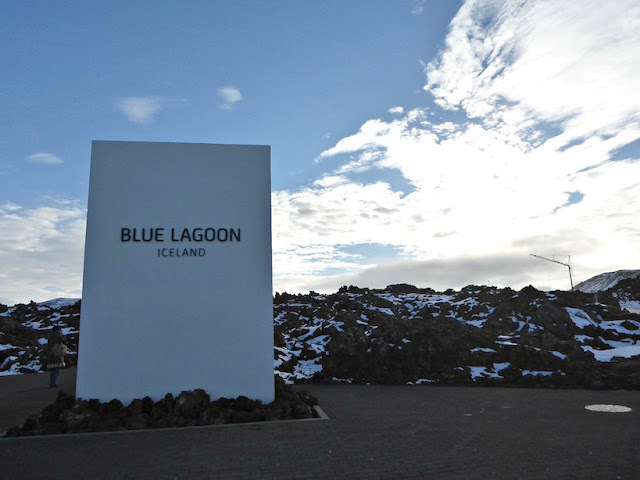 Situated a short 20 to 25-minute drive from the airport and 50 minutes from Reykjavik, a visit to the Blue Lagoon makes an easy stop off just after you land or prior to your departure point. There are many options on how to get to the Blue Lagoon from Reykjavik. At the airport, there is a bus that takes you to the Blue Lagoon and there are regular transfers from Reykjavik to this geothermal spa. You may need to book these in advance, I recommend checking this out before you go in case you do. We hired a car and drove from Reykjavik. When you arrive there is a small building for luggage storage which is perfect if you coming from or going to the airport. 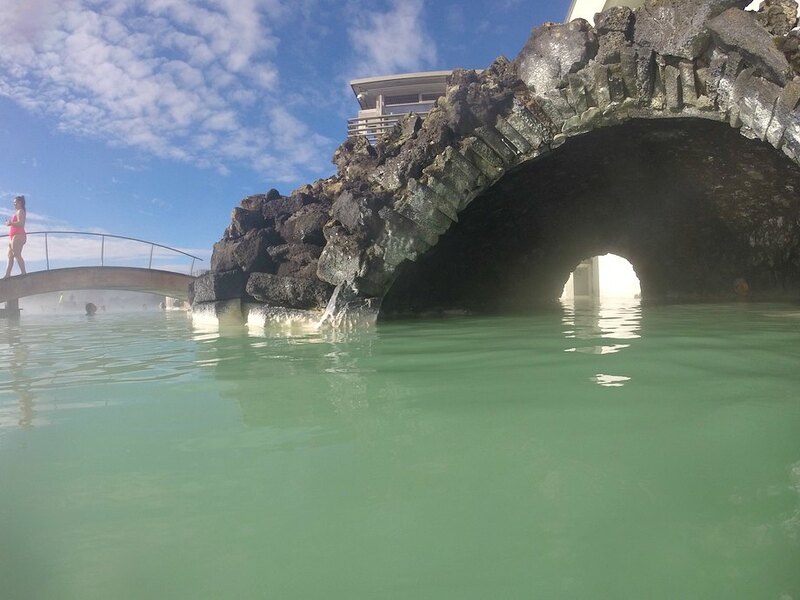 There is a photo opportunity before you enter the Blue Lagoon on the left. Look at the gorgeous water above. Top Tip! We visited on a cold March day when there was still snow on the ground from the previous week's heavy snowfall, so I wondered how warm we would be in the geothermal waters. Read on to find out. We bought tickets previously online. It is extremely unlikely that you would get an entry ticket to the Blue Lagoon if you just turned up as often tickets are sold out days and even weeks beforehand, so book before you go. Top Tip! There are different types of tickets which you can book online. Price is determined by the time of day and how far in advance the ticket is booked. You need to take a print out of your tickets with you to the desks. There will be a couple of different lines. One for Standard and one for Comfort and above and/or coach parties. Well behaved children at the Blue Lagoon are welcome from the age of 2. If you child is under 13 it is free for them to use the facilities. Armbands are mandatory from the age of 2 to 8 and they are provided free of charge. If you are bringing children check with the Blue Lagoon website to see how many you can supervise at any one time. The Blue Lagoon is open from 8 am every day. Closing time varies between 8 pm and midnight. There are longer hours in the Summer as Iceland gets more daylight, and it can still be light at midnight. The best time to visit is early in the morning or later in the day. Busiest times are usually just before and after lunch when coach parties arrive. Your ticket gives you a one-hour window option for entry. There is no exit time and you can stay as long as you want. If you want to hire a towel, robes and flip-flops and haven't already paid for the hire in your ticket price, they can be hired at reception. Take a towel with you to save money, as towel hire is 700 ISK or about £5.20. I took a loose beach cover all, instead of a robe and you may want to consider this. Top Tip! Flip flops are not really needed in my opinion, as the changing rooms are right next to the water and once you are in you don't really want to get out to walk around. You are given a wristband on entry to the Blue Lagoon and this also acts as your charging band to pay for treatments and refreshments. You pay at the exit when you leave. The wristband also lets you use the lockers, you swipe a band and it lets you close a locker. Be sure that the locker is locked before you go away as they were a little glitchy. As is customary in many Scandinavian countries before you use the water you will need to shower without clothes. There are signs asking you to do this and it is clearly mentioned on the website. I was unsure about showering in a communal area but there was a number of private cubicles, 6 in the section I was in and so I used a private cubicle. You may have a short wait for these if it is very busy. There is shower gel, shampoo and conditioner provided. You then put your swimming costume on to enter the Blue Lagoon. In the changing rooms, there are a limited number of hairdryers to use to dry your hair after you come out of the pool later and a number of mirrors. The minerals in the water can play havoc with your hair so it is recommended to use the conditioner provided in the shower area before you enter the water. I combed it through my hair and left it in. If you have long hair I would recommend tieing it up out of the way to protect it as much as you can. Top Tip! 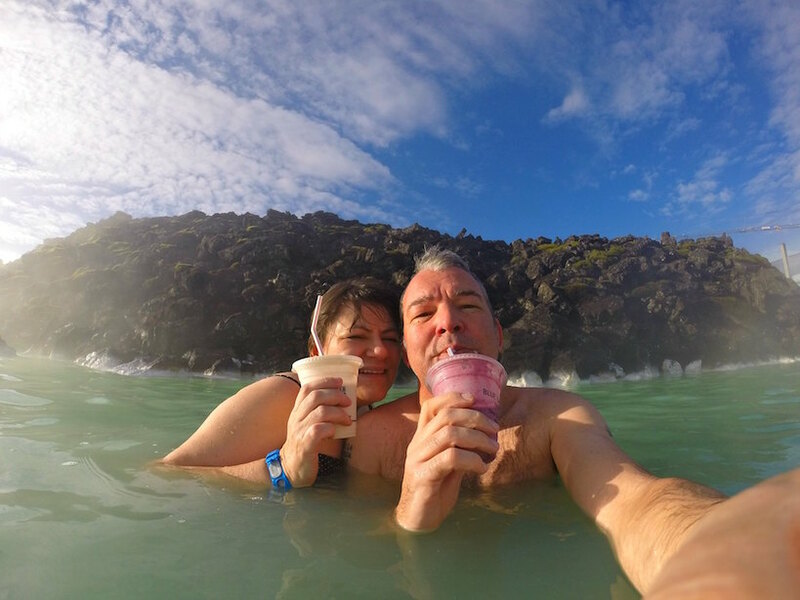 The weather in Iceland is notorious for being very changeable so be aware of the weather forecast and use waterproof suncream on all areas above the water. The light reflects from the water and this can make you more likely to burn. Pay special attention to this if you have very fair skin or burn easily. They do recommend glasses and contact lenses are removed before entering the water. Prescription glasses can be damaged by the water. Sunglasses are recommended to protect your eyes from the sun, however, leave you best Gucci sunglasses at home just in case they could get damaged. 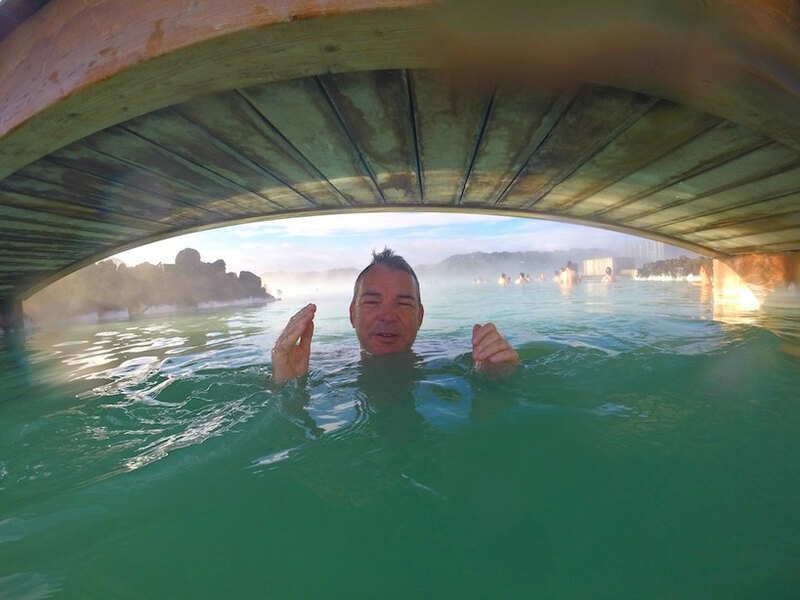 The Blue Lagoon holds 9 million litres of geothermal seawater which is renewed every 40 hours. The blue colour comes from the way silica reflects light and the green in the water is from the algae which multiply when exposed to direct sunlight. Apparently, if you pour it into a clear cup it will look white as the sun makes it look blue. Often I felt the water was more green than blue. you will not feel cold whilst in the water even if it has been snowing. What is not widely known is that there are slightly hotter and slighter cooler sections of water which make it more fun. 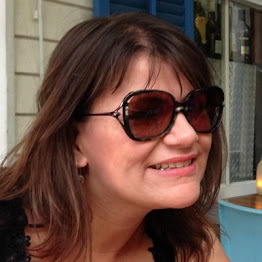 Have a wander around and see what I mean. Top Tip! The depth of the water varies. I am 5ft 2in and I could just about touch the floor everywhere. you will feel squidgy sections under foot which is the mud. You will see two bars on the water. One is a bar where you get your free face pack and buy more expensive face masks too. The other bar in a different area on the far right of the main pool where you can buy drinks, such as beer and wine, Skyr smoothies (an Icelandic dessert like yoghurt), soft drinks, water-resistant phone protectors and sunglasses amongst other things. You swipe your wristband to pay for the items. 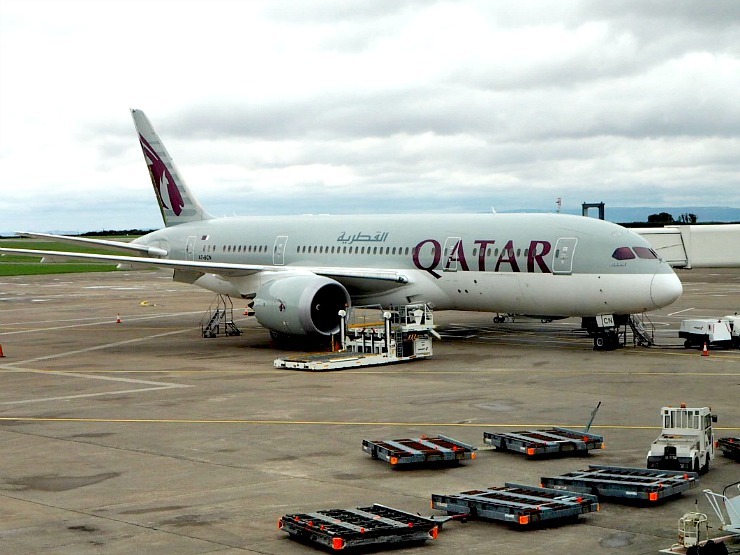 If you have just arrived in the country it may surprise you how expensive everything is! Expect to pay £7 plus for a smoothie. The Blue Cafe serves snacks, salads, sushi, sandwiches and hot and cold drinks with a view of the Blue Lagoon. if you are coming with someone but do not want to go to the Blue Lagoon, you can sit here with refreshments and watch the people in the pool. Prices are expensive but in line with the average prices in Iceland. If you are coming from the airport it may be a shock! We found the average price for a cappuccino in Iceland to be around £3.80 for example and a toasted sandwich £9. There is also a small outdoor area which is great for photo opportunities. Top Tip! There is an upmarket restaurant attached to the Blue Lagoon called the Lava restaurant and reservations in advance are recommended for lunch and dinner. To give you an idea of prices, the main courses at the Lava restaurant for lunch are from 4500 ISK or £33, for dinner main courses are from 5900 ISK or £43. After you shower and change into your swimming costume you walk down stairs to the main doors. These are where the floating devices are for little ones. You go outside and hang your towel up and any robe if you have one, the coat hooks have numbers on so be sure to remember where you have put your belongings as if you hire your towel and robe they all look the same. You then walk into the steaming water which has a milky blue/green colour. The water is lovely and warm and with the steam coming off it, it is like a scene from Dr Who, minus the monsters of course! After a wander around we got a free facemask from the treatment bar. Mr W slapped it on his face and I did my neck and shoulders. We were told not to let it in your eyes so we didn’t. You leave the face mask on for five minutes before washing off. Mr W felt his face was as soft as a baby's bottom. 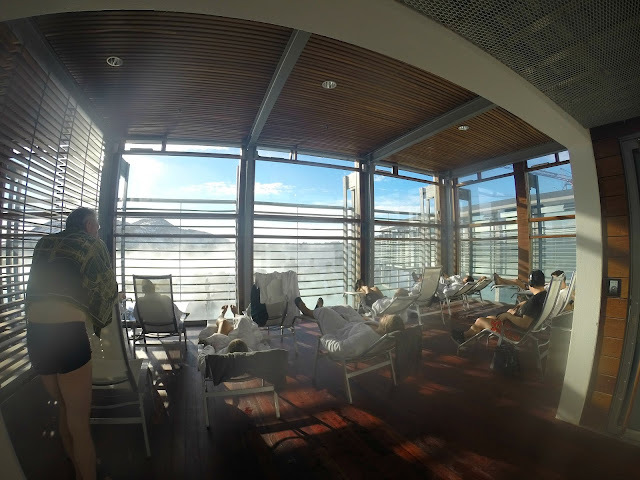 There are pockets of water of different temperature but mostly it is a warm 37 to 40 degrees C. This is the perfect temperature to relax and enjoy the warm water easing away any aches or pains. They say it is important to drink plenty of water when you are in the water and we tried to do this. Although bringing food and drink from outside is discouraged, I could see no problem bringing a bottle of water with you to drink. Top Tip! We took our Go Pro to get these photos. If you are taking any form of camera equipment make sure it is waterproof, we saw people taking photos in the water with their phone but we thought they were mad, don't risk it, if you want to do this, buy a reputable waterproof cover. They do sell these at the swim up bar but I don't know how good they are. Top Tip! Jewellery can be affected by the water so remove jewellery before entering. In-water massages can be booked in advance and start at 10,200 ISK. Cameras are allowed but not in the changing rooms. There is a steam area, and a steam cave to visit as well as a man-made waterfall. 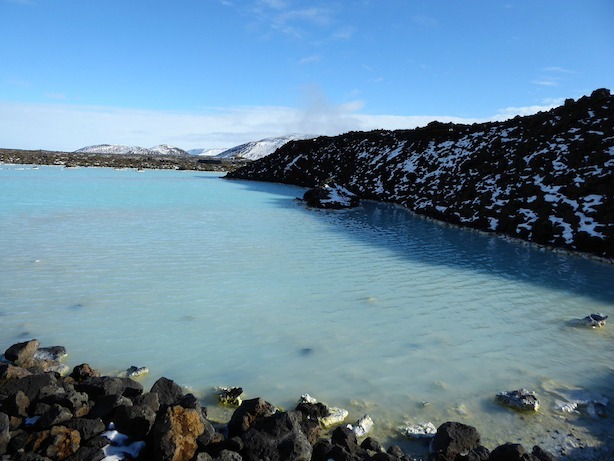 You may smell a sulphur smell as you drive up to the Blue Lagoon. Once you are in the water you won't smell it. There is a shop where you can buy Blue Lagoon branded products. If you want to stay close by there is a luxury hotel called The Silica Hotel a ten-minute walk away. Guests have a range of benefits including their own private lagoon and complimentary premium admission. Leave your goggles at home, the water is milky and you will not see anything. There is an indoor area with sun loungers for relaxation. If you forget your swimwear you can rent some at the reception from 700 ISK. The Exclusive Lounge is a small area for up to 12 people with private. changing rooms and an array of complimentary items for a luxury experience. This needs to be booked in advance. Here is a video Mr W made of our time in the Blue Lagoon for our travel blog Fly Drive Explore. 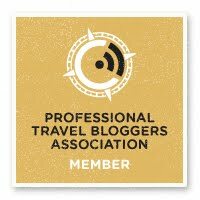 Check out our 7 day Iceland road trip too. I personally felt that the Blue Lagoon was a great experience. Yes it's expensive, yes it's touristy but the water is gorgeous and warm, it feels like it is actually doing you good and it is a lovely relaxing experience. My only negative point would be that both myself and Mr W heard staff in the shower areas be quite abrupt to customers, so maybe customer service could be looked at more closely. There is no excuse for rudeness, especially when you are paying a lot of money for entry. Tell me would you visit the Blue Lagoon? Have you ever been to Iceland? Oh my goodness, it looks wonderful! That place looks absolutely amazing! I'd love to go there, and I'm sure my wife would too! Wow!.This is so lovely.I would love to go to the Blue Lagoon.I would plan towards that. I think I may have to if I go back. 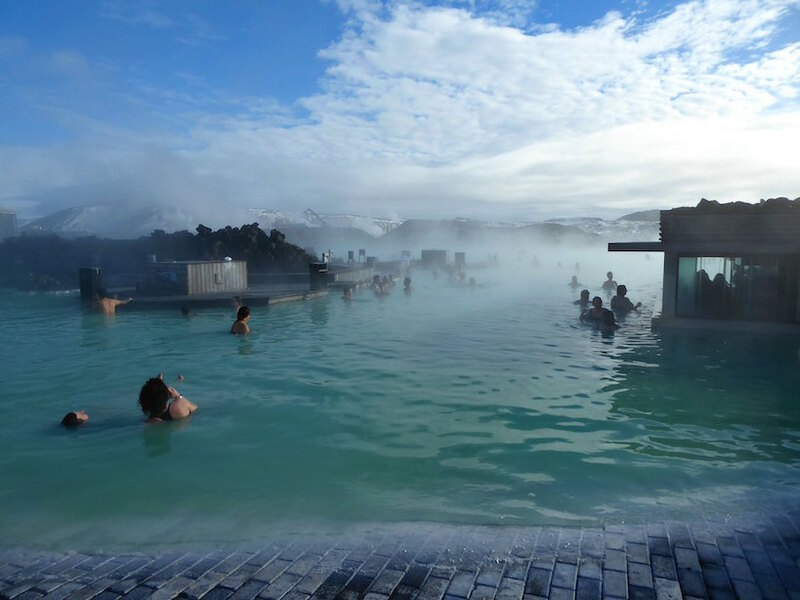 This is definitely on my list for when we got to Iceland one day. That is a good tip. Were they ok with you taking your own food and drink in? Having a swim up bar like this is an excellent idea. It was very pricey but just budget for that when you go. Oh wow this looks amazing, I would love to take a trip here one day and its great that I could bring along the kids too! 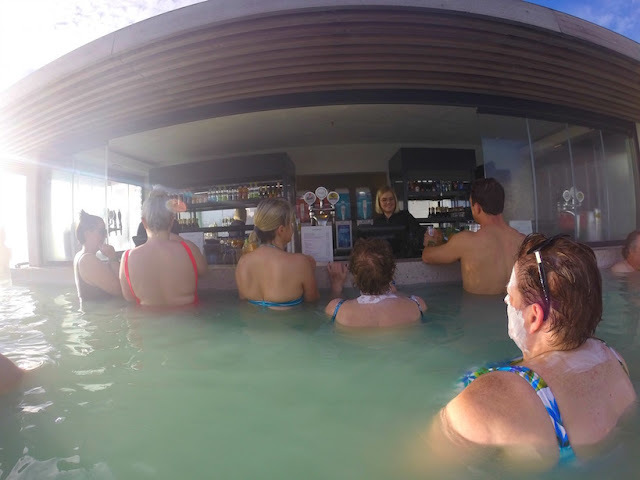 I also love the idea of having the bar in the water area! 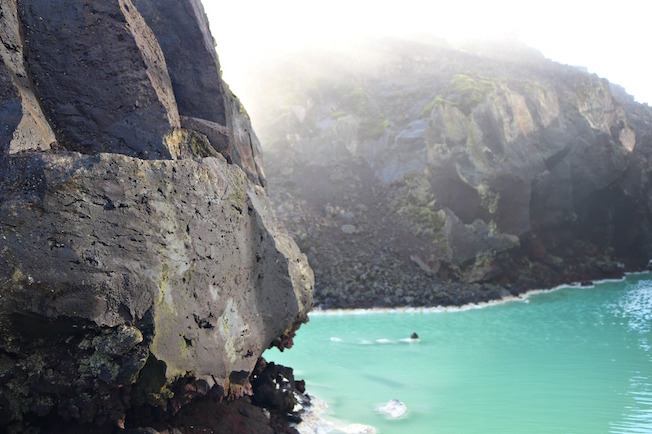 The Blue Lagoon is one of the most amazing places I have visited in my life. A fab informative guide! Thank you Talya and I am so glad you are a fan too. Oh my goodness what an absolutely amazing looking place to go and visit! I would love visit myself one day, though I'm not sure I would want to leave! We didn't want to leave, the water is so warm and the environment is really relaxing. Iceland is one of my top places that I want to visit! Iceland has so many places and activities that interest me. I want to see the Northern Lights and I would love to visit the ice caves. The Blue Lagoon is also a top location I would like to visit and I'm glad that I now know to buy a ticket in advance if I do ever get to go to Iceland. We didn't have a chance to see the Northern Lights unfortunately, but that's a good excuse to go back! Go Kara, don't think about it just book a trip to Iceland. You won't regret it.